We offer Sound Proof Cabinets as well as Sheet Cabinets. 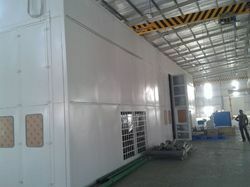 Our clients can avail from us a wide range of Sound Proof Cabinets in global markets. These Sound Proof Cabinets are made by using superior quality raw material that provide them high strength as well as longer life. Our Sound Proof Cabinets are available in various sizes as well as designs that can also be customized as per our customer's requirement at the most competitive prices. Our range of products find application in various Industries. Size: as per standard and Customized too.